For Investors and Stakeholders: How Will Valuations Change? There are at least two ways tax reform could significantly impact business valuations. Besides affecting future after-tax cash flows, tax reform means companies will also be immediately adjusting their financial statements. Many companies have significant balance sheet items relating to tax, aka deferred tax accounts. For example, a net operating loss carryforward would be a typical large balance sheet asset. Companies value these deferred tax items using the income tax rate expected in the year of utilization. Hence, changes in enacted tax rates will consequently cause account values to change. If corporate rates decline, so will deferred tax asset and liability balances. Of course, tax reform would impact every organization differently depending on each company’s profile. This is especially true for the Tax Cuts and Jobs Act, which has business policy objectives behind it and hence affects different industries, operating models and ownership structures very differently. While companies that disclose non-GAAP numbers might choose to omit the impact of reform from their press releases, stakeholders still need to know the implications in order to plan for potential valuation fluctuations based on GAAP earnings-per-share models. For Tax Leaders: Will Financial Statements Be Ready? Corporate tax teams have many responsibilities, but usually the most important task is calculating financial statement tax expense, both correctly and on time. Failure to accomplish either of those is typically a career-limiting move. When it comes to the Tax Cuts and Jobs Act, though, we are worried for our tax leader clients, as there may be insufficient time. Any impact of changes in tax rules on financial statements needs to be reflected in the period that the new laws are enacted. This rule applies for both year-end reporting and interim reporting. In the case of a U.S. federal tax bill like the Tax Rate Cut and Jobs Act, enactment would be the date that the President signs the bill. The Republican Party leaders overseeing the initiative are optimistically forecasting presidential signature for late December or early January. In the case Congress passes a bill and the President signs, companies will need immediate determinations of complex accounting implications. Any transition rules, phasing in or out rules, or temporary status rules will complicate the accounting even further. (See the chart below for examples of the complexities.) Given that most financial statement deadlines fall within weeks of books closing, in-house tax departments will have insufficient time to properly calculate tax expense. Although passage of a bill is still far from certain, there would be no time to recover from guessing wrong in the case a bill is passed. This is likely true even if Congress passes a diluted or compromised version of the current House bill. Note that even a late-enactment of tax reform (e.g., in 2018) could be problematic. 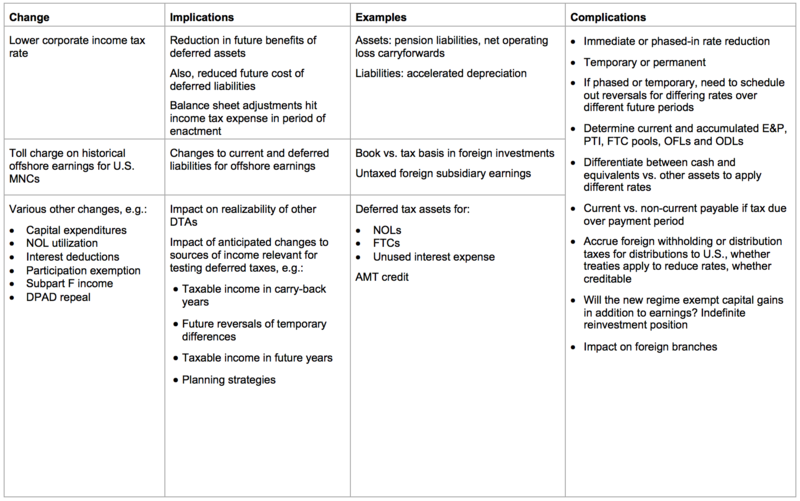 If the President signs the bill after the first of the year but before financial statements are filed, companies will still (likely) have to disclose impacts in the current period, including estimated changes to deferred tax accounts for changes in laws or rates (and, for interim reporting, the impact on effective tax rates). In addition, companies must make valuation allowance decisions based on all available information as of the financial statement issuance date, which can occur well after the year-end. Here’s a non-exhaustive list of financial statement issues to consider. These are just a few that come to mind as examples; we of course recommend a full analysis. There are multiple state tax complexities and uncertainties, e.g., whether the states will follow federal changes. The tax law change could have an impact on previously recorded uncertain tax positions. In A&M’s view, companies ought to be modeling the impact of potential reform immediately — first to determine the impact on valuations and second to avoid financial statement delays early in 2018. You need a trusted source of information and analysis to monitor and digest the constantly evolving tax reform environment in the coming months. To date there have been countless articles about the potential effect of tax reform on companies both large and small, with the focus of these articles on the potential outcomes of tax reform on companies’ effective tax rates (please see the links below to A&M Taxand articles).